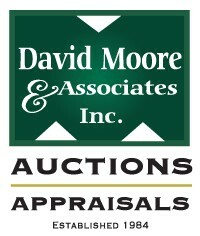 We at David Moore & Associates are very proud to be able to offer our auction services, simply because we know that with our experience, technology, marketing and advertising, attention to detail, and expertise, there simply is no better method of selling virtually anything! An auction will bring you the best current fair market value for your goods. Selling your goods by yourself is time consuming and may not bring the best price. Selling privately usually results in a one-to-one situation with no competition. By utilizing our marketing and planning expertise, and our skill and experience you will get a group of bidders together in one place, at one time, all interested in the same items. The results you receive are the maximum current value for your goods, determined by the highest bidder. You will also know the exact date and time that your goods will be sold. No more sitting by the phone waiting for it to ring. The auction method is not a ‘distress sale’. As a matter of fact, once you have used the auction method, you will learn how effective it is to buy/sell by auction. The auction industry provides a valuable service benefiting both buyer and seller.